1 – Curling Iron – This will give you a different style curl than a traditional curling iron. 2 – Nars Check Palette – Love these blush colors, great for getting a bronzed look and pink checks. 3 – Nars Lip Colors– I love how these wear and the colors are great. 4 – Mac Look in a box – I’ve heard great things about this Mascara and eye liner. 5 – Clarisonic – I love mine. Leaves your skin feeling so clean. These brushes are great if you already have one. 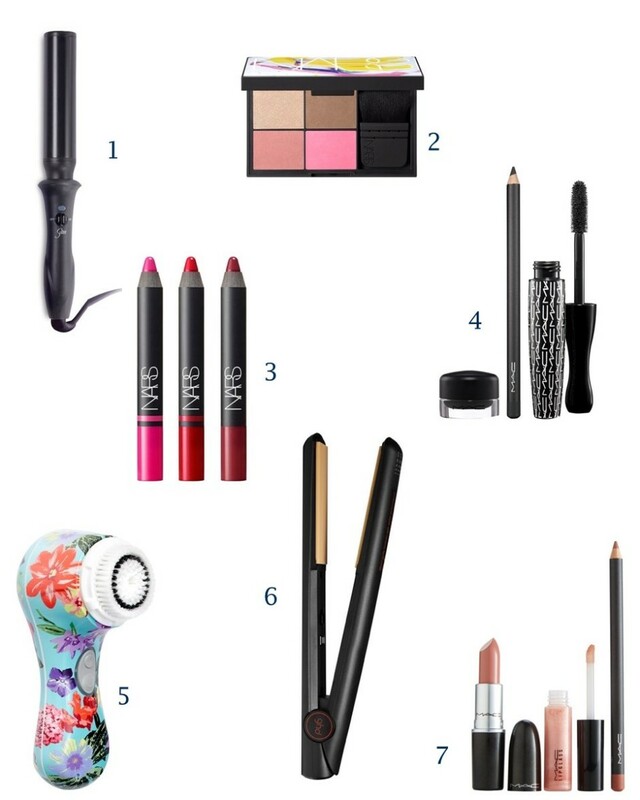 6 – ghd Straightener – I’ve used this straightener for years and I highly recommend it. 7 – MAC Lip Box – I bought this myself. I love the colors and comes with instructions. 1 – Zella Tank – Love this one and such a great price. 2 – Nike Half Zip – I have this top in a few colors. 3 – Nike Tank and Nike Shorts – I wear this for running and love the fabric. Very breathable and great for working out in. 4 – Nike Shoes – Love these black shoes for working out. 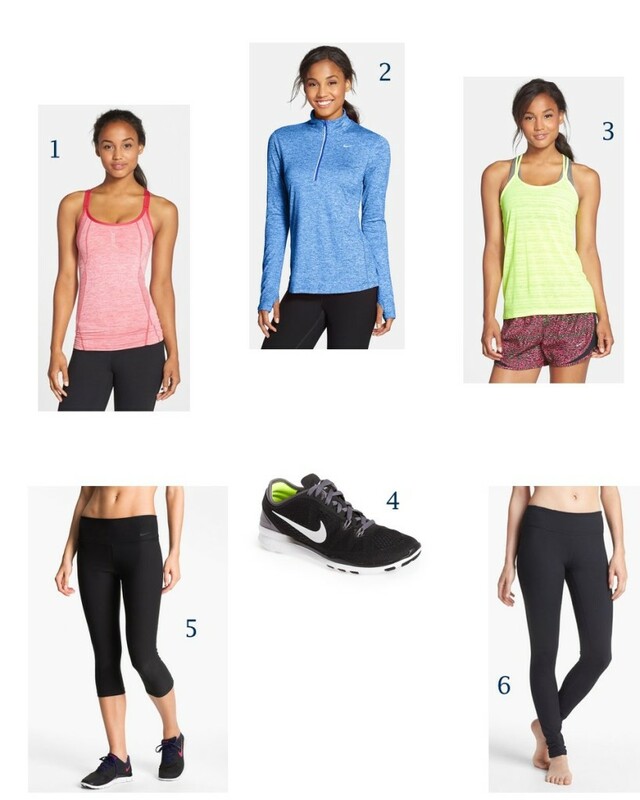 5 – Nike Capris – My favorite workout pants. 6 – Zella Live in Leggings – I’ve heard great things about these and they have good reviews. 1 – Lush Shirt ($28)- I bought this last year one the sale and use it so much. It’s a great layering piece. 2 – Topshop Fur Vest – I got a vest like this last year on the Anniversary Sale and am really happy with it. 3 – Marc Jacobs Bag – I keep looking for an excuse to buy this bag. The leather is really soft and it’s a great bag. 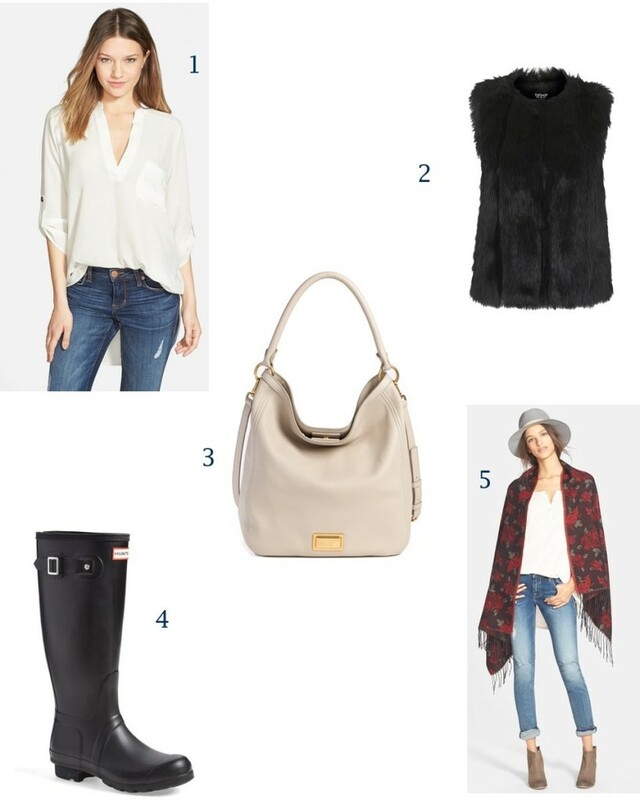 4 – Hunter Boots – I wear these all Fall and Winter. They rarely go on sale. 5 – Hat, Wrap, Jeans ($44) and Boots – I love this look and would pair it with the Lush top I mentioned before. I love that Nars palette for summer! So perfect summer! Aw these sound really great! Nice favorites! thanks for sharing!